If you already own Karma Deck Pro or buy along with this, you can get this ebook for half price. Are you alone and deckless? No problem. Now "deckless" does not mean "powerless" anymore. Just have this one single Kommando Kard with you in your wallet or pocket and you are set to perform these 15 amazing routines, without ever needing a deck of playing cards. Yes, this is deckless stack magic and deckless card mentalism rolled into one. A path breaking style and refreshingly new way of performing card mentalism using the Karma Deck stack (you will need to be familiar with the Karma Deck ), but without having a physical deck of playing cards on you. With just this one Karma Deck Kommando Kard you can perform these 15 mental miracles and play it up like almost pure, propless mentalism. You can do away with all the finger flinging, deck handling, shuffling - false or otherwise, sleights and all that business of examining the deck by the audience etc. When you actually use a deck of cards, the deck somehow becomes the center of attraction and however much we try, the audience remain with a feeling that after all it could be a card trick. Also there is a long standing debate whether it is appropriate to use playing cards in a mentalism act. Kommando Kard is the ideal solution for this. The mentalist can now actually use playing cards without using a physical deck of cards. So it all remains a purely 'mind thing' without getting 'physical'. And in this case the mind power of the performer is the center of attraction and not some deck of cards. The Kommando Kard comes across as a very casual and natural aid. The idea of a Kommando Kard is very simple. But in that simplicity lies its power and flexibility. No sleights, no stooges, no preshow, no reset. Completely self working and works anytime, anywhere with anyone. Just the knowledge of the stack is what is required. For some routines even that is not required. Instantly repeatable with different outcomes. Highly flexible from a 1 minute close up encounter to a 15 minute stage act. Street, parlor or walk around. Very easy to perform with high impact. You get here the readymade design of the prop/gimmick. Just print and use. You also get 4 different stack versions for you to print and use. Alternate method to do the routines without actually knowing any of the stacks is also explained. The 15 routines explained are as follows. I love the Karma Deck, but it only allows casual examination by the spectators. The Kommando Kard allows you to perform many of the effects that require a stacked deck, but (1) WITHOUT a deck of cards AND (2) it will withstand examination by the audience. Like the old American Express commercial. "Don't leave home without it!" The UNKNOWN MENTALIST has done it again. I would recommend buying the KARMA DECK and KARMA DECK PRO first, and then you might as well buy this. What you get is a dynamite card you can print off to do various mentalism and super memory stunts. Of course if you don't buy it you'll only have yourself to blame and I'll be glad to use these effects for myself. Even in my wildest dreams, I could not have thought of performing stack magic without a deck of cards. 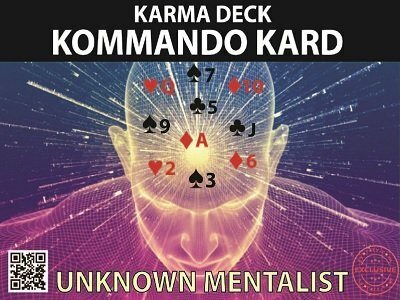 Kommando Kard is an unbelievably simple idea which is mind blowingly powerful.This will be one more bench mark in stack magic by the Unknown Mentalist. The 15 routines provided are extraordinary. Very easy, very deceptive, very stunning. The brilliant high point is some of the routines can be performed even without knowing the Karma Deck. Those are so deliciously self working. Is there no end to the unconventional thinking of the Unknown Mentalist? Once again, like Karma Deck itself, this idea of Kommando Kard is an unbelievable twist in the field of stack magic. A truly great idea of performing stack magic and card mentalism even without a deck of cards. I think this will start a new genre of stack magic and even card mentalism. Amazing range of 15 killer routines with just one Kommando Kard in your pocket. This is mind boggling. Excellent buy. If there is an Emmy Award for stack magic, I would give it to Kommando Kard. I bow to the Unknown Mentalist for his devious mind and extraordinary out of box thinking. Kommando Kard is more like a one man army or a multipurpose swiss army knife. The very premise of deckless card magic and that too stack magic is mind blowing. 15 killer routines on this theme is a great achievement. KK will now be a permanent occupant of my wallet.